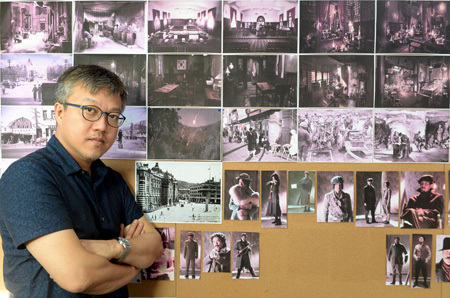 Choi Dong- hoon, a South Korean director, began his voyage into filmmaking in 2004 when he released The Big Swing, a crime thriller, which brought him instantaneous praise from domestic and foreign critics. A couple of years later, Choi Dong- hoon repeated his previous success with another interesting production, Tazza: The High Rollers, an adaptation of Huh Young- man and Kim Se- yeong’s manhwa of the same name. The film, which revolves around “a group gambling drifters involved in the Korean card game Hwat”, was a huge commercial success and won various awards. In 2006 he was involved in Choi Dong- oh’s The Restless and returned to directing in 2009 with Woochi, a fantasy action film. Three years later he made the heist film, The Thieves, which attracted over 12.9 million viewers and is currently the fourth highest grossing movie in Korean film history. It seems like Choi Dong- hoon really takes his time when it comes to making a film. After the enormous success of The Thieves, the director waited a few years before releasing his new movie. In 2015 he presented to the audience the espionage action film Assassination. In spite of the fact that the film has received mixed reviews, it still managed to earn, “as of August 2015, a total of 77 million dollars from 11,79 million admissions”, as well as The Blue Dragon Film Award for Best Film. One of the renowned Korean actresses, Kim Hye- soo, once said that Choi Dong- hoon is “a genius who also works extremely hard. I think he knows who he is, the exact kind of films that he wants to make, and how to make them.” Undeniably he is one of the most successful filmmakers of modern Korean cinema whose films always guarantee a good time. You are one of the most successful film directors in modern Korean cinema. All five of your productions: The Big Swindle, Tazza: The High Roller, Jeon Woo- chi: The Taoist Wizard, The Thieves, and your latest hit Assassination have become a profitable success. How did you manage to achieve that? Making a film is fun but extremely difficult for me, an ordinary person. I enjoy breaking through such difficulties though. Of course, worrying about the audience’s expectation is scary and something that I can’t escape from. But what can I do? I should just accept it with gratitude. It is daunting to be called a “10 million director” (a Korean term for a director whose films were watched by 10 million viewers), but I feel grateful just by the mere fact that people know my name. Assassination is your first period drama, how did you come up with the story and how did the script evolve? Was it a long process? In my case, I started with a photo of resistance fighters and spent 9 months developing the script and production itself. During this period, I was obsessed with the thought that ‘the resistance fighters must have felt solitary’. People who had to live in those days would have wanted to be happy and possess romance as well. I wanted to capture their anxiety, solitude, and hardship in my film. Production wise, what sort of challenges did you have to face while making Assassination? There was wide-spread superstition that a film that has a background in Japanese colonial era would not be successful. There were strained relations between people who invest in the film and people who watch me making the film. Besides, the characters in my script had heavy emotions. So shooting Assassination was like climbing a mountain. It was like a picnic when I was shooting The Thieves. But I realized that climbing was as thrilling as a picnic. It required more effort but at the same time, that made us cheer each other up more and made the experience enjoyable and valuable. After the critical acclaim for The Thieves three years ago, were expectations high for Assassination? The expectation for Assassination was, of course, high. But there were also uncomfortable views about the movie because all previous movies about the period of Japanese occupation were commercial failures. Despite all the fear of criticism and potential failure, I really wanted to make that movie as I had been preparing the story for 9 months. It was not about how it would be received by the audience. It was a movie that I wanted to watch. What was your vision for Assassination and what message or story were you trying to get across to the audience? I thought I had to spend more time on characters than on my previous films. I focused on giving vivid and realistic feelings than merely spectacles. I prefer to show scenes long and minutely. I wanted to show the main character’s struggle and, at the same time, its approach towards its goal. I made a film hoping that the characters in Assassination could be created inside of audience’s hearts after watching the film. I like the scene where Gianna Jun ran with a gun because I could feel her intense desire in the scene. How do your films appear to you? Do you think each film is better than the last one or is there a high mark somewhere along the way you would like to achieve once again? I’m not concerned about making a better movie or a movie with better ticket office result. But I do care about trying new things. After finishing The Thieves, I wanted to get to the bottom of a charter’s psychologies and/or destiny. I wanted to create a description of a person walking straight into his/her own destiny. There is this huge debate going on, in Hollywood as well as in Europe, about film and digital filming. Christopher Nolan has been faithful to his film cameras, he refuses to work on digital ones. James Cameron and Luc Besson, on the other hand, are in favour of the digital camera. What are your thoughts on that? Have you ever worked on the film camera before? I’ve shot three movies on film cameras and the remaining two on digital cameras. Digital cameras are more convenient in shooting at a fast pace. And it is always a turn-off if I have to replace films rolls when we have a momentum going on. However, even if I use a digital camera, I always want to emulate a film camera. I want my screen to be soft and my sunshine to be sparkling. I even want my CGI to look real. In my head, movies are always on film. What do you personally consider to be your favourite film genre? I like crime films, they are always full of villains. But there is good and evil among villains as well. I think that is where the attractive point of crime movies is at. I hope the audience can experience a world in a film that is totally detached from the real world cheering good villains. The Big Swindle, which you filmed in 2004, was your first feature as a writer and director. What was your biggest learning curve in the leap from being 1st Assistant Director (Tears 2001) to a full time feature director? Before joining the directing team for a film, I had shot 4 short films, all of which received lukewarm reception by the audience. Back then, I usually watched movies or read books alone, and movies were a strange world in my head where things were too tangled and complicated to be understood. Tears was about runaway teenagers, and the director gave me the assignment to prepare reports after meeting runaway teenagers on the street every night. I met more than 700 runaway kids, and through conversations with them my world in the movie met the reality. From that experience I learned: Preparing a movie scenario is writing a story; but making a movie is creating a character. In Assassination, your cast is filled with great character actors like Lee Young- jae, Gianna Jun, Cho Jin- woong, Hwa Jung- woo and Oh Dal- su. They are all people we have seen pop up in countless films and they always leave a mark, even in small roles. How was the casting process for you? All the actors I worked with respected each other and understood the film very thoroughly. And they knew that a film is a collaborative work. Making a film is hard, but it was very pleasing to work with such good actors. Assassination started with the image where a woman wearing a white dress walks slowly with a gun in her hand. When I was thinking of the image, Gianna Jun came up in my mind without any hesitation. It was a subtle image and she knew exactly what it was like. Lee Jung-jae is very expressive actor. He made himself solitary to express a character who is villainous but lonely as well. Of course, he did not behave like he is an actual villain during the shooting. It was my first time working with Ha Jung-woo, but I felt like I worked with him several times before. I really enjoyed working with him because he is a person who enjoys empathizing with directors. In Assassination, because Ahn Okyun (Gianna Jun), Yem Sek-jin (Lee Jung-jae), Hawaii Pistol (Ha Jung-woo) are the characters who are representations of the period, I wrote a story where they are main characters. But I also wanted the audience to chase other characters’ past. Other characters are not as detailed as the main characters, but I think their lives are also a part of my movie. What was the best piece of film criticism you have received in your career? My second movie – Tazza – didn’t get much exposure outside Korea maybe because it has a strong local flavor/ingredient. As such, I was very grateful to read the column in New York Times about the movie. They called Hyesoo Kim as Lee Marvin in Ava Gardner’s body and told the readers to bet on sensual Tazza and said that they won’t lose. I remember being happy for a few days thinking that my movie is sensual. Are there any upcoming films you are working on or plan to work on? Nothing has been decided at the moment. I think it would take time to get myself out of Assassination. Maybe it will take more than The Thieves took. But now I think I’d like to get into emotions more deeply. Pictures © Courtesy of the photographer.